Published: July 3, 2016 at 05:02 p.m. Updated: July 8, 2016 at 07:42 a.m.
A coach's job is never done. It's Thanksgiving time and Bruce Arians cycles through game tape that provides examples of teams losing games due to simple mental lapses. Eli Manning throws the ball out of bounds instead of taking a sack. Brandon Marshall fails to set himself in time, leading to a game-ending false start penalty. A Ravens defender grabs Blake Bortles' facemask, giving the enemy new life. "Each week these games come down to critical errors," Arians tells his players. "It's really not as much who makes the plays, it's who don't f--- it up. Don't be the guy who f---s it up." Days later, Cardinals guard Ted Larsen almost f---- up his way out of town. With seconds to play and the Cardinals trying to clock the ball to set up a winning field-goal attempt against the 8-1 Bengals, Larson jumps. If he's penalized for a false start, there will be a 10-second run-off that would push the game into overtime. Luckily for Larson, he gets bailed out. A Bengals defender is penalized for mimicking the snap count, the Cardinals kick a chip shot and escape with a win. But Arians lets Larson know his Cardinals career would have been over if the call went the other way. "Ted, you're very, very, lucky you (weren't penalized)," Arians says in a team meeting the following day. "There's no f------ excuse for you to move in that situation when we're killing the clock." It wasn't long ago that Arians cut a guy for parking in the wrong spot. Larson, and every Cardinals player, knows coach isn't bluffing. Halfway through All or Nothing: A Season with the Arizona Cardinals, we are struck by how much Arians demands of his players. This is not a cuddly man. Accountability and execution is expected. Arians can coach 'em up with the best of them, but he's just as likely to mothereffer you into another galaxy if you let him down. "I think he's the best coach in the game," says Palmer, whose pairing with the coach allowed the passer to escape a mid-career cul de sac. "Because he's always educating everybody. It's one of the things that Bruce does that separates him. That makes him who he is." Episode four of All or Nothing captures a increasingly successful Cardinals team that's still trying to put it all together. Arians will continue to push for greatness. Anything less won't be good enough. » We're always in good hands with NFL Films. They own a vast vault of NFL history and they know how to make the most of that advantage over the competition. In one sequence we span the decades and watch Arians having private conversations with previous pupils Peyton Manning, Ben Roethlisberger and Andrew Luck. That segues into a present day chat with Palmer. The message is clear and effective: Arians has helped turn great prospects into Hall of Fame producers for years. » Throughout the series, we've watched Cardinals coaches call on team veterans to help establish a culture of accountability in the locker room. That's on full display after cornerback Patrick Peterson organizes and leads an off-day, players-only tape study session following an underwhelming win over the Niners. These meetings don't happen unless the players have bought in. » When we talked to Carson Palmer at the All Or Nothing premiere in Los Angeles, the quarterback said he constantly turned down requests from NFL Films producers who wanted to get a closer look at his personal life. Still, you definitely feel like you have a better handle on Palmer the person after watching these episodes. I particularly enjoyed his workout session with young son, Fletch, and a practice aside where he passionately defends his abilities as a basketball player. The show has made him more than just a fantasy stud or a just a guy that's been around forever. » The Cardinals sign former Seahawks and Jaguars defensive lineman Red Bryant before the Niners game. When asked why it didn't work out in Jacksonville (Bryant was cut just one year into a multi-year pact), general manager Steve Keim vaguely offers the Jags just wanted to get younger. You'd expect these teams to have more info than the general public, but that doesn't appear to be the case here. 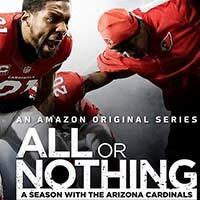 Stream the Amazon Original Series "All or Nothing: A Season with the Arizona Cardinals" on Amazon Prime now at amazon.com/allornothing.